Our local Pulitzer Prize-winning food critic, Jonathan Gold, named Plan Check #71 in his 101 Best Restaurants in L.A. 2014. It is the poster child of the now overused designation of “gastropub.” A superb restaurant indeed, it served a delicious selection of craft beers — including my current favorite, Ballast Point Sculpin IPA — a variety of fingery bar foods and artisan pickles, and several carefully curated hamburgers. “I think we must be close,” said Greg. Ironically, it all began a few blocks from my apartment at the time in Santa Monica, at a funky beer bar called Father’s Office. An institution since the 1950s, it had sawdust on the floor, graffiti carved into the tables, an impressive selection of beers — and no food. In 2000, it was purchased by Sang Yoon, a former chef at the venerable Michael’s — the very birthplace, some would say, of California cuisine. Sang got rid of the sawdust, added halogen pendant lighting, and introduced the “Office Burger” — a patty of dry aged beef topped with Maytag cheese, caramelized onions, bacon compote and arugula. It was served medium rare, no ketchup, no substitutions. The burger zeitgeist had begun. En route to Plan Check, Greg and I passed another new burger restaurant, a highly anticipated Las Vegas transplant called “Bachi Burger,” which had already been a year in the making. “We’ll have to try that one when it opens,” I said, defying my own concerns about burger saturation. Greg and I ordered — a sandwich of light, cloud-like Jidori chicken so wonderful that if Jack in the Box could reproduce them, they would sell billions; and a special burger scrawled in chalk on the “specials” chalkboard (another trademark of the gastropub), the “smokey & spicy PCB” (Plan Check Burger). As we usually do, we would cut them in half and share. 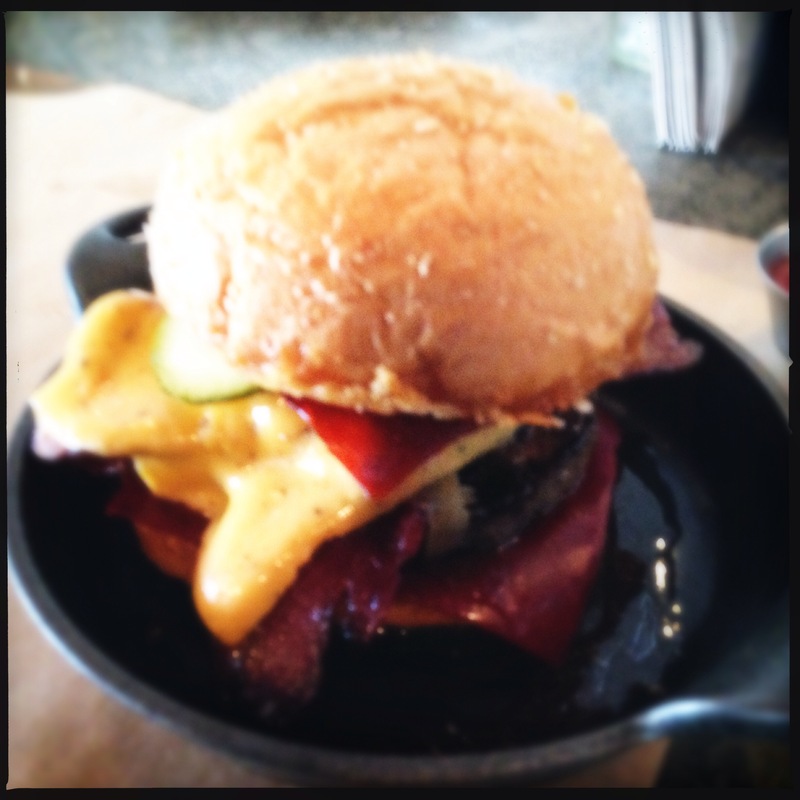 The regular PCB burger pairs the requisite high-quality beef with “americanized” dashi cheese, ketchup leather, schmaltz onions, mixed pickles and a crunch bun. To this, the “smokey & spicy” edition added habañero cheese and Sriracha leather. The hallmark of any great burger, in my humble opinion, is the convergence of the condiments into a symphonic whole — you can choose the very best, most expensive add-ons, but if the components stand out and distract rather than complement the meat, you’ve failed. As with the regular PCB burger, the smoky spicy hit all the right notes and left me longing for more in the days that followed. Are we near burger saturation? Who knows. A good burger is still a thing of sublime beauty. Two decades after the beginning of the gourmet coffee revolution, there are Starbucks on every corner. Maybe, just maybe, there is still room in our gastronomic universe for the next great burger. Great list. Especially funny considering the thing I read on Kobe/wagyu recently (i.e. that NO ONE is getting real Kobe beef in the U.S., and all wagyu means is “cow” in Japanese.) I don’t know that I need gold flecks, foie gras or truffles in/on my burger. And I definitely don’t need a little blob of caviar to be lost on the bun. And BTW, patas negras are one of my favorite things. But who in their right @#%ing mind would put them in a hamburger is beyond me. Mmmm. Chris and I just shared a Father’s Office burger yesterday, at the Santa Monica location. It was as good as ever. After many years going to the Culver City location, we’ve returned to the Santa Monica one – there’s a good barber shop next door, and on a Sunday afternoon, Chris can get a quick haircut while I hold down a table. Count me in on dah boyz day out to Bachi Burger. The Las Vegas store has a burger with beef, shrimp and pork all put together Thai style! that and a frosty IPA and I will be in burger heaven! While we’re waiting, I think I need to get you to Plan Check for a “PCB” (Plan Check Burger): americanized dashi cheese, ketchup leather, schmaltz onions, mixed pickles, crunch bun — or a Bleuprint Burger: smoked blue cheese, pig candy, fried onions, roasted garlic steak sauce, pepper cress. Try that with a Sculpin Double IPA, if you will! I think there will always be new “ground” to cover on the burger waterfront . . . count me in too on the “getting a burger at any burger joint with you”! Chances are it won’t happen as there are 3,000 miles tween us but as I’ve heard many times “you’ll be here in spirit”. Spirit burger is not on the gourmetized menu! It just ain’t the same as 3D T&S in the Here&Now! Hope to break bread with you again soon enough, eh? I know our future will be burger-and-beerful together my friend. Living on 12th and Montana I was spoiled with the luxury of stumbling to and from Father’s Office. The “Office Burger”, and many of these gourmet hamburgers are delicious…but I will take a hickory burger at Apple Pan over most gourmet burgers! Next time you visit Plan Check try the pastrami! I know that stumble well. How did we miss each other all those years? I will try the pastrami next time. And I’ll pretty much take a Double Double with extra grilled onions over anything. I gave a side eye to the words “ketchup leather” and “Sriracha leather” but I’ll still admit the picture of that burger gave me an instant craving. I go back and forth on the burger craze — sometimes I want a plain-jane burger with cheese, pickles and onions on a squishy bun. Other times I’ll totally add a piece of seared foie to the top. I do like trying new burger places that pop up though — always looking for a new favorite! Totally get you on the ketchup/sriracha leather side eye. Despite the cutesiness factor, they are superb inventions — like thick fruit roll ups that melt in your mouth. Also with you on the need for a plain old burger sometimes — above and beyond all the gourmet ones I’ve had, In & Out Burger is still the best. My favorite burgers of all time are burger shack burgers. Like griddled patties, sesame bun, American cheese. I loved the one burger I had at In & Out — wish they had one of those up here! In Austin we asked around for the best regional burger chain. We were going to go to Whataburger but locals convinced us to hit up a place called P. Terry’s. It was perfection!